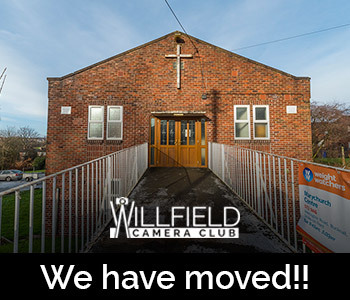 When I first heard that Willfield Camera Club had been invited to exhibit portrait images at the museum in conjunction with the Taylor Wessing Portrait (which is also currently exhibiting at the museum), I was very excited as this is a big coup for the club. However, for me, portrait is not my strong point as I generally prefer travel photography, animals and macro. I was a bit out of my comfort zone, but this is a good thing, getting me to think and hopefully acquire transferable photography skills – you never know your luck! I’ve done a bit of studio photography (mostly at the club), but always concentrated on experimenting with light and learning to use the available equipment. My goal was always to try to get a visually pleasing image and the models seemed as objects to photograph like any other – even if I do have a good laugh with them and they work with me to get good shots – unlike most subjects! With portrait photography, it’s so much more: telling the story of the person or people in the photo, capturing their spirit, personality and soul – sounds a bit like a horror movie! I was stuck! I started by Googling portrait images and starting a pin board on Pinterest. If you want to see them, click here. Believe it or not, I was hoping to be creative too! I’ve often heard new writers being told to write about what they know, so with that in mind, I decided to go with what I know and told my hubby that he was to be my model. I desperately tried to get inspired but struggled. 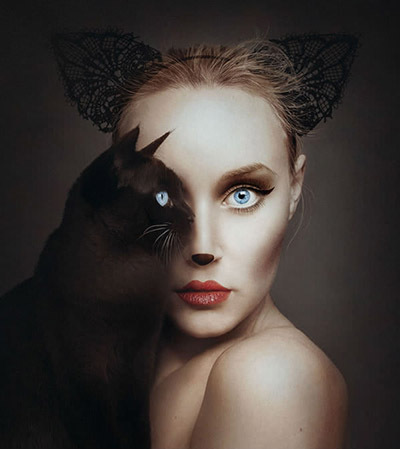 I found an image of a woman and a cat and was drawn to it as there’s nothing better than a cat. Btw, the image is part of a series of animals’ eyes in place of humans’ eyes, click here to see it. 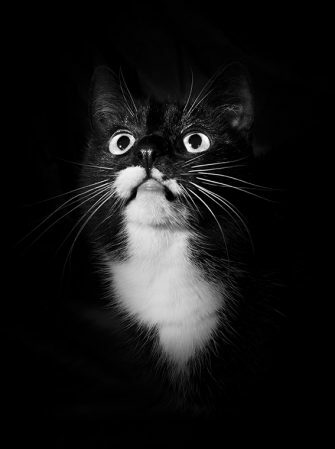 I bought some heavy-duty black velvet for the backdrop (as this soaks up the light) and covered all furniture in black. Glyn wore a black t-shirt. I set up two flash guns on tripods and we were off! I practiced getting the light right before my cat, Bod was summoned. The big flaw in my plan is that Bod struggles to sit still when being photographed. A while ago I attempted a shoot of her, with the help of Glyn, Whiskas Kitbits and Dreamies proved invaluable at getting her to pay attention. I quickly learned that after she finished one treat, she would look up expectantly for the next one – this was the time to quickly get the photo. My plan was to use this trick again, the only problem was that this time my cat-wrangler was also the main model. So eventually I had give up for the day. 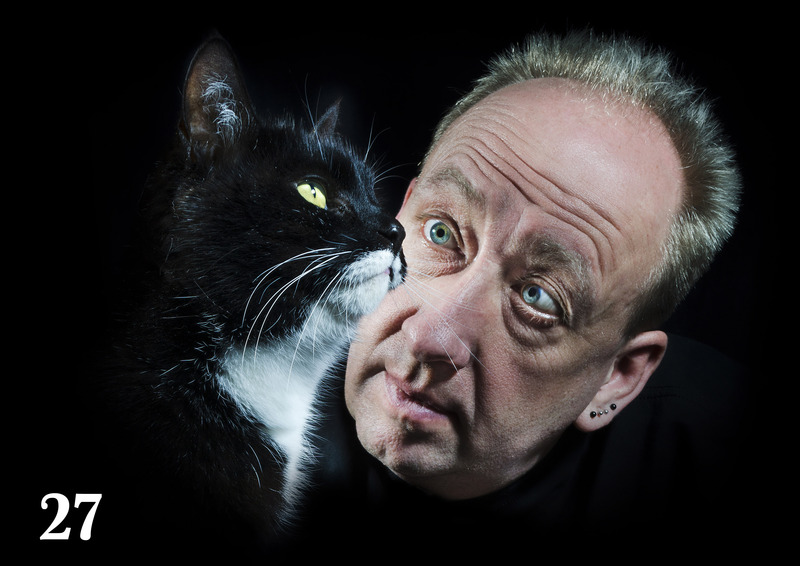 The following day, I enlisted the help of Darren to cat-wrangle and advise on lighting. After many, many attempts, Bod was gorged on treats and was getting bored. So we had to stop despite not having any images like the one which had inspired me. But when i looked through the images, I found this one that I have entered. Upon looking at it, I realised that it told the story of Glyn and Bod perfectly. Glyn is looking so hopeful that Bod will do as requested, but knowing that it will never happen. Bod is aloof, looking anywhere but at me. She’s had her fill of treats and we’re all damned lucky that she can still be bothered with us. So in hindsight, I believe that what I finished with is far better than my pie-in-the sky original idea!